This bottle is typical of a series of early- to mid-Qing overlay bottles, which have very small mask-and-ring handles, flared, very confident and crisp feet, and masterful carving against a bubble-suffused, milky ground. An indication of the early period is provided by the wide mouth and well-rounded carving with a degree of three-dimensionality. The words for lotus (lian) and ducks (yazi) evoke the term lianjia which conveys a desire to be first on the list for the three-level (district, provincial and capital) civil service examinations in succession while the fenghuang and bamboo (zhu) stand for abundance (fengzu). 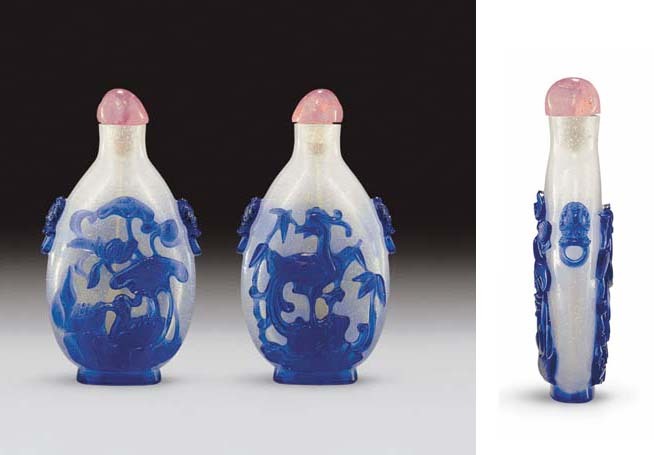 Compare with a blue overlay on bubble-suffused glass snuff bottle from the Bloch Collection carved with a similar motif illustrated by Moss, Graham, Tsang, A Treasury of Chinese Snuff Bottles, Vol. 5, Glass, no. 928.